Thanks to the STrib’s Libor Jany for posting the Statement of Probable Cause for Allen Scarsella. The four are Scarsella, Joseph Backman, Nathan Gustavsson, and Daniel Macey. 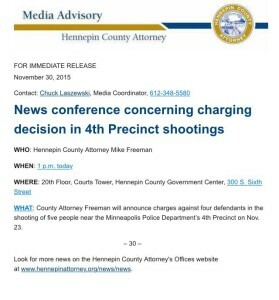 Hennepin Co. Atty. Freeman’s press conference starts soon. 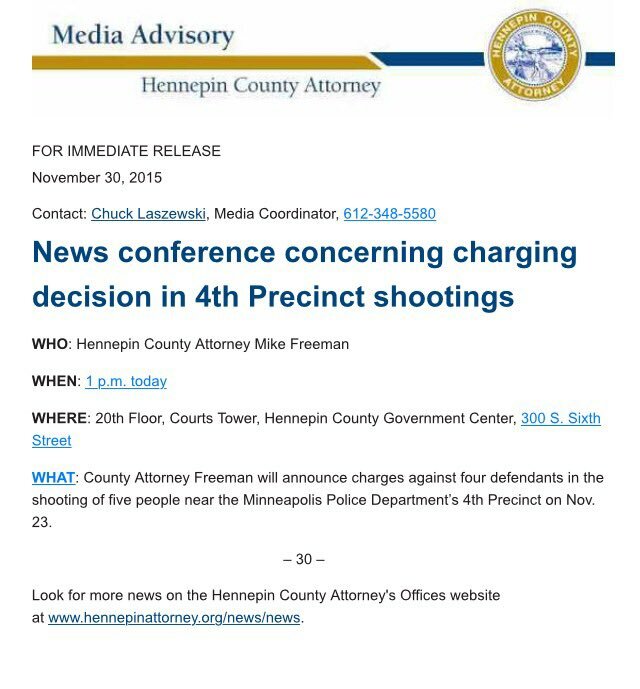 It looks like all four will be charged. I’m very glad to see the County Attorney handling this quickly. I believe they’re also looking at whether to charge this as a hate crime. Given all the video and online threads, it’d be pretty hard to show it wasn’t a hate crime. Allen Scarsella, 23, who prosecutors said in a complaint had admitted to shooting five protesters, was charged with one count of second-degree riot while armed and five counts of second-degree assault. Joseph Backman, 27; Nathan Gustavsson, 21; and Daniel Macey, 26, were each charged with second-degree riot in the Nov. 23 late night shooting that left five demonstrators with wounds that were not life-threatening. This is progress, a start. Here we go again, this year’s Power Plant Siting Act Annual Hearing. Methinks cognitive dissonance has people’s minds in a wringer leading to silence. Whenever a police officer is killed or seriously injured on the job, my facebook feed lights up with “Prayers for _______,” “blue line” memes, and #policelivesmatter hashtags. Officer Garrett Swasey was killed by a white male terrorist at Planned Parenthood of Colorado Springs, likely one of the first on the scene of that violent attack. 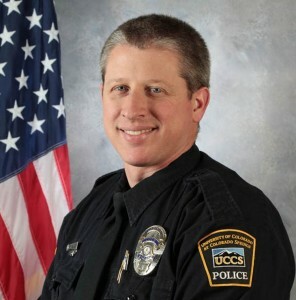 Five other officers, not publicly identified, were injured. Yet the internet is virtually silent. The usual many, many comments are not there. Only two of the many people I know who are usually filling the feed with “Prayers for” comments have offered concern about the fallen officer, and there’s been nothing at all regarding those injured. What am I thankful for? I’m thankful that we have an opportunity, today, to recognize and acknowledge our rights, and our right and obligation to stand up for our rights and the rights of everyone, but particularly the rights of women, blacks, Muslims, immigrants, and everyone else who is under siege. It’s times like these where I’m thankful to be an attorney, sworn on oath to uphold the Constitution, grateful to have this piece of paper that says I can open a door for others. Day to day, I do this in a small way, helping people speak up, participate, and exercise their rights. But the much larger picture is so ugly. Each and every one of us, this is our right and our obligation. We have lost so much in the rights department since 2001, and now our most fundamental Constitutional rights are being challenged from all sides, in many venues. Stand up, ramp it up. Last week, racist terrorists with stated intent to raise hell shot unarmed #blacklivesmatter #justice4Jamal protesters in Minneapolis. 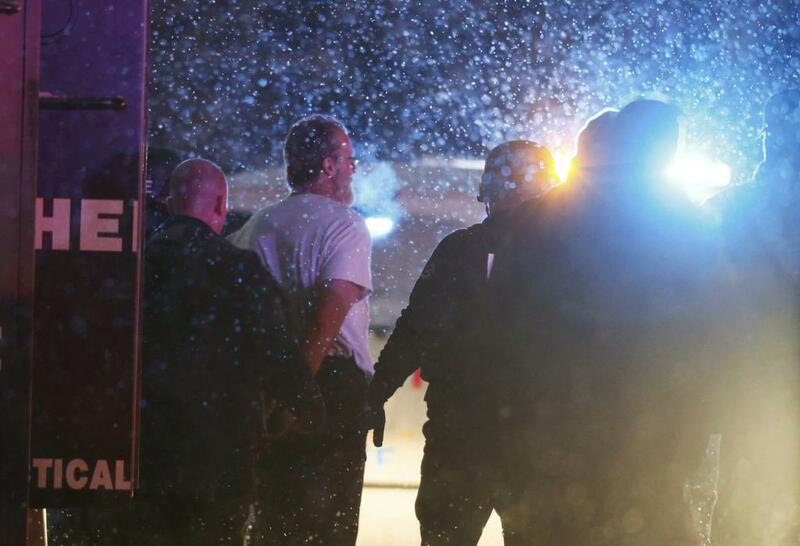 Today, it’s a domestic terrorists shooting at a Planned Parenthood clinic in Colorado Springs, CO, so far shooting at least one police officer killed and four injured, and two civilians killed and unknown others injured, 9 or maybe more civilians injured. We share the concerns of many Americans that extremists are creating a poisonous environment that feeds domestic terrorism in this country. It’s not surprising there’s be a terrorist at a Planned Parenthood, it’s happened before, and will probably happen again. But it raises the issue of responsibility of speech. One of the latest right-wing political distractions has been a protracted, orchestrated, inflamed and vitriolic focus on Planned Parenthood, based on a phony video, and aimed at cutting Planned Parenthood federal funding. Nevermind that Roe v. Wade is the law of the land since 1973, despite so many attempts to legislate it away (like the 50+ attempts to repeal “Obamacare”), since that time there have been repeated efforts to strip federal funding, many Planned Parenthood clinics do not offer abortions, abortions constitute just 3% of services, and look HERE at the government funding. And today a guy goes in and shoots up Planned Parenthood in Colorado Springs, CO.
What this says to me is that this is not about abortion. It’s a rallying cry to limit Constitutional rights, and to prevent women’s access to health care and birth control, cancer testing, and STD treatment. In tandem, we see a rallying cry to prohibit entry of refugees, to establish a “religious test,” and such inflamed hatred directed at Muslims, citizens and non-citizens alike. Horrible, ugly stuff. Over and over, the rants are based on a claim of theocracy, the the U.S. is a “Christian” nation, and that only “Christians” should be allowed in. Not a thought is given to the founding of this country by people fleeing theocracy! No weight is given to the Constitutional prohibition of establishment of a state (government) religion. And in Texas, a Texas militia group posts names and addresses of Muslims and “Muslim associates” (report HERE) for what purpose other than to encourage “religious” terrorists? Here’s THE Texas Militia site: Texas Militia. Same one? Donald Trump is a prime offender, but it’s much broader than Trump. HERE: One way to handle hate speech without undermining the whole concept of freedom of speech at Brunel University where Katie Hopkins was a panelist in debate. The threads are being taken down, but many have screenshots. Interesting that some of the comments on the City Pages article have disappeared, names were named in those disappearing threads, at least one showed up in comments, and surprise, and at least one has disappeared as well. UPDATE: Saigamarine released, to others arrested. Here’s the “connect the dots” piece: REVEALED: Accused Minneapolis shooters fascinated with guns, militia groups and the Confederacy. UPDATE: Two arrests so far… 23 y.o. white male in Bloomington, and 32 y.o. Hispanic male in south Mpls. For several nights running there have been white supremacists coming to the 4th Precinct, their online stated intent to shake things up and hurt people. One shot from any gun of any kind that only wounded one protester would set of the spark that will open the season on Dindus. If you get away with it. Points for using a bow and arrow with expanding razor blade head. Cut the bar code off the arrow if you bought it at the store. Keep gloves on when you handle your arrows and make purchases in cash. Don’t buy equipment in front of a video camera and then go Dindu Hunting before the data gets erased. (You probably have no way of knowing how long it is kept, if it was erased or even recorded.) It will be used against you. Wait a few weeks, have patience, don’t get greedy. One Testimony (slain Dindu) that can’t be traced beats 50 that got you killed/captured and tortured. It makes the Dindus think that the “enemy” is everywhere. That causes them to lash out at the wrong people. Consider a shotgun slug or 00 buckshot for short range. 30-06 or similar for long range. Remember. LE’s will kill you for trying. So will Dindus. Unlike what the Dindus say, LE’s are not on the side of Vigilantes. If you can run with the best of them, you could use a small pistol and disguise and flee to a car or bicycle that you have placed in a concealed area. Subdivision 1.Threaten violence; intent to terrorize. Whoever threatens, directly or indirectly, to commit any crime of violence with purpose to terrorize another or to cause evacuation of a building, place of assembly, vehicle or facility of public transportation or otherwise to cause serious public inconvenience, or in a reckless disregard of the risk of causing such terror or inconvenience may be sentenced to imprisonment for not more than five years or to payment of a fine of not more than $10,000, or both. As used in this subdivision, “crime of violence” has the meaning given “violent crime” in section 609.1095, subdivision 1, paragraph (d). Subd. 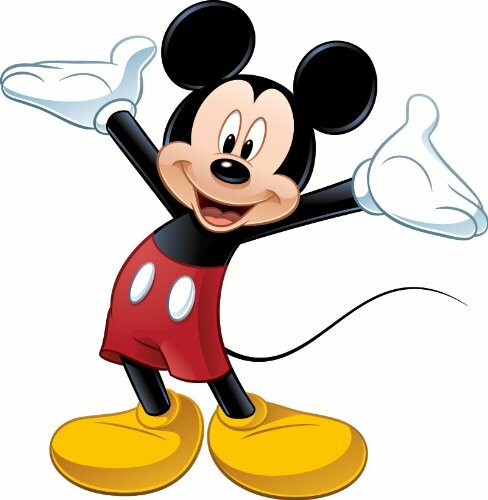 2.Communicates to terrorize.Whoever communicates to another with purpose to terrorize another or in reckless disregard of the risk of causing such terror, that explosives or an explosive device or any incendiary device is present at a named place or location, whether or not the same is in fact present, may be sentenced to imprisonment for not more than three years or to payment of a fine of not more than $3,000, or both.